The 2019 Honda CR-V leads the pack for roomiest rear. The compact SUV segment is saturated with excellent options to get you and your family where you need to go in style and comfort. So how do you choose the right one? One of the best reason to buy a compact SUV is for the flexible cargo space. You can keep your rear seats up when all you have to stash are the groceries, fold them down to fit the home improvement supplies or fold just one rear seat for the skis and snowboards. These five compact SUVs will fit your lifestyle if you're looking for a healthy blend of performance and optimal cargo space. There's a lot to love about the 2019 Honda CR-V. Not only does it house a potent and efficient 1.5-liter turbocharged inline-four engine which gives you 190 horsepower and 179 lb-ft of torque, but it also offers the most hauling space compared to its rivals. The CR-V has 39.2 cubic feet of cargo space with the rear seats up and 75.8 cubic feet with the back row folded down. These numbers are above average for the segment and you'll find the space to be easily accessible with a power liftgate or hands-free power liftgate. Inside, you'll find the cargo space wide and user-friendly without any intrusions. The CR-V gives you 75.8 cubic feet of space with the back row folded. The Subaru Forester is often lauded for its safety features and adventure-ready exterior but there are plenty of additional reasons to buy it. Above average cargo space is a big one. The 2019 Forester gets an increase in cargo space of two cubic feet which brings it up to 35.4 cubic feet behind the rear seats and with the seats folded down, the crossover presents you with a massive 76.1 cubic feet. Not only is it vast, but the Forester's cargo space is also designed to handle all the gear an adventurous family needs to haul. The cargo area can be equipped with tough textured materials that don't mind a little mud and dirt with their easy to clean surface. Get 35.4 cubic feet behind the second row and 76.1 behind the first with the Forester. Buying the Volkswagen Tiguan gives you the flexibility to choose between a three-row model or a two-row model to gain extra space cargo space. For the last redesign in 2018, the Tiguan got extended by a foot to accommodate either option. If you go with a three-row model, you'll get 12 cubic feet behind the rear seats, 33 cubic feet with the third row up and 65.7 cubic feet with all seats folded up. A two-row model is a trade-off between seating fewer passengers but getting more cargo room. You'll get 37.6 cubic feet behind the rear seats and 73.5 cubic feet with them folded down. An additional benefit of the Tiguan's cargo area is that it is smartly designed with available pockets throughout that let you organize smaller items. If you have your hands full, use the available hands-free power liftgate to make loading all your gear a breeze. Get a maximum of 73.5 cubic feet of cargo space in the two-row Tiguan. The 2019 Toyota RAV4 gets a full redesign for 2019 and goes back to its sporty roots with a more aggressive exterior and a new Dynamic Force 2.5-liter inline-four-cylinder engine bringing horsepower to 203. Having the active and adventurous customer in mind, Toyota put serious planning into the updated cargo area of the 2019 RAV4. The new cargo area includes side pockets behind the wheel wells and two height levels for the cargo area deck which allow drivers to load either long or tall objects. Get 37.5 cubic feet of cargo space when you have backseat passengers or fold the rear seats down, and you get a roomy 69.8 cubic feet. 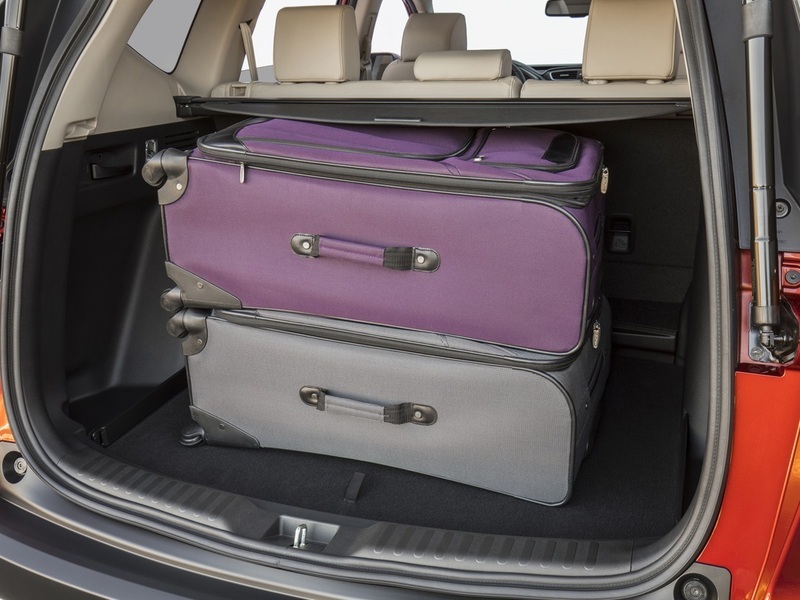 Total cargo space behind the first row of the RAV4 adds up to a massive 69.8 cubic feet. The 2019 Ford Escape combines performance and car-like handling with a functional cargo area. Based on the trim, you'll get either a turbocharged 1.5 liter 179 horsepower four-cylinder or a 245-horsepower 2.0-liter for extra oomph. On top of the great ride, you'll also get a towing capacity of up to 3,500 lbs which is impressive for the segment. Thanks to above average cargo space, the Escape will easily fit all your gear with its 34 cubic feet behind the second row. To magically double your space, just fold down the second row and get 68 cubic feet of room. An optional power liftgate makes the flexible cargo area easy to reach. The Escape has 34 cubic feet of space behind the second row and a grand total of 68 cubic feet with seats down.